Earn up to 11,145 reward points. Soprano with raw bronze brass alloy construction. 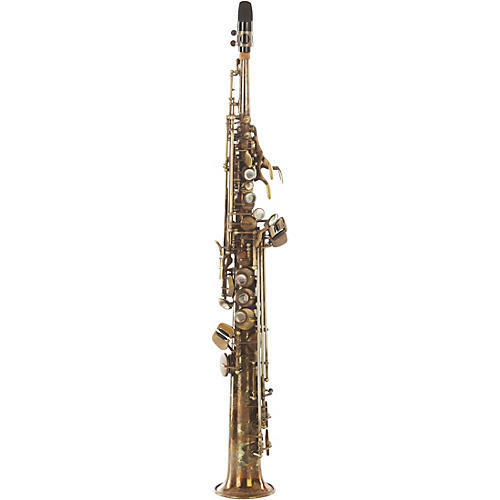 Sax Dakota offers professional-quality saxophones in all of the primary categories, including the sweet soprano. This is the SDSS-XR-72, a great-sounding, easy-playing soprano with style and a sense of itself that may just resonate with you perfectly. Soprano saxophonists will appreciate the playing action, cosmetics and most of all the sound of this instrument. This baritone saxophone is constructed of a wholly unlacquered bronze brass alloy. Between its unadorned body and the finely detailed hand engraving, it presents an alluring vintage appearance, and its acoustic properties tend to enhance that visual impression. It has a rather accelerated taper in the upper section of its one-piece drawn tube, and the key touches are brilliant black NACRE mother of pearl from select Abalone. Reduced turbulence guarantees a focused sound and timbre. It is a free-blowing instrument, but not so much that it pulls all of the wind out of you, and its key placement is a perfect, effortless fit for most hands. Its tone, response, action and ease of play belie its fair price.